This sablefish is thoroughly pickled in a traditional style (honzuke) for 48 hours in Saikyo miso. 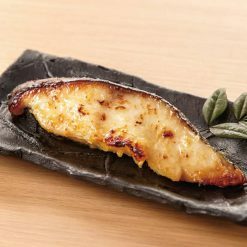 This item features ever-popular sablefish with fat, made into Saikyo-zuke. 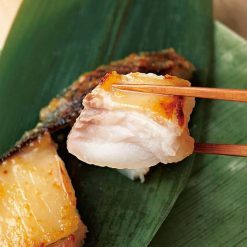 This sablefish has been thoroughly pickled in a special, seasoned tare sauce that makes use of Kyoto-style white miso. Saikyo miso is a paste typically made with fermented soybeans and rice and used in a variety of ways, including seasoning fish or tofu and creating soup broth. Sugarlady’s seafood is caught in season and processed right away, ensuring that you always receive the highest possible freshness and flavor. Because this sablefish comes seasoned and ready to use, the amount of time you need to set aside for preparing fish dishes can be drastically reduced. In addition, because the fish comes frozen, it is easy to have plenty of it on hand at any time without worrying about it spoiling. Sugarlady’s seafood and other frozen products allow you to cook meals from all sorts of real, nutritious ingredients whenever you desire, even on the busiest of days! Sablefish is a great fish choice due to both its relatively low levels of mercury and its high levels of beneficial omega-3s. How to defrost: Defrost in bag in the refrigerator. To defrost more quickly, place beneath running water.To cook on a fish roaster or other implement: Once the sablefish has defrosted, gently wipe away some of its miso coating and then cook the sablefish on a grill or in a frying pan. Will burn easily, so please cook with care.This product has not been deboned, so please use caution. 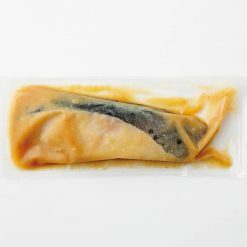 This product contains sablefish (Canada), rice miso, hon-mirin, table salt, sugar.. Origin of ingredients: sablefish (Canada). Prepared and packaged in Japan.